Chumph wants a special counsel to investigate the so called Russian Uranium deal. The problem there is that there is no evidence of any wrongdoing by Clinton. 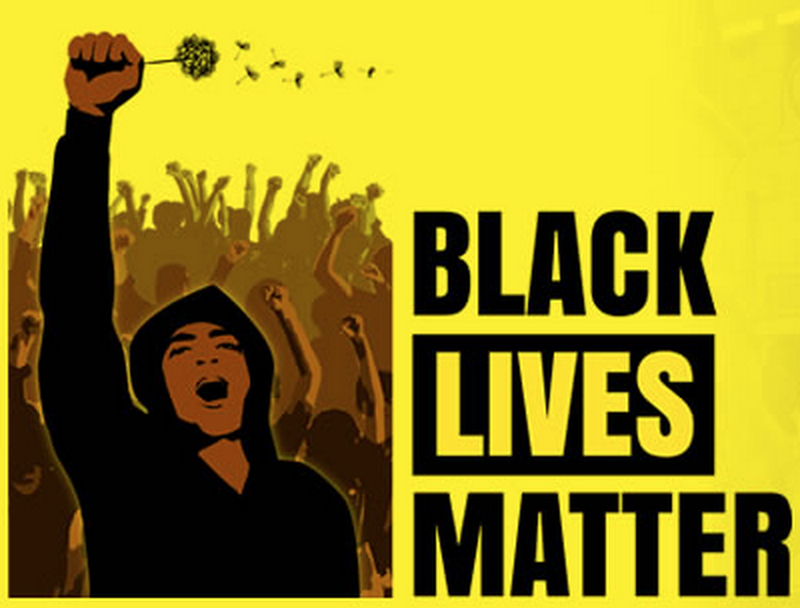 The whole thing is nothing more than a political ploy and an attempt to suppress dissent through abuse of power. Appointing a Special Counsel to do so is in itself an Impeachable act. This one is far out enough out on the edge to greet with some skepticism. If true, confirmation should be available in a few days. It is impossible at this point to tell which crime he’s being charged with. Was this the real reason for the Comey firing? Has a ‘sealed indictment’ been issued against President Trump? Blogger and fierce critic of President Donald Trump Louise Mensch and former Clinton White House official Claude Taylor are both saying that independent sources have separately informed them that a sealed indictment has been granted against the president. “Separate sources with links to the intelligence and justice communities have stated that a sealed indictment has been granted against Donald Trump,” wrote Mensch and Taylor at the Patribotics blog. Mensch is known as something of a polemicist — some dismiss her as a crackpot conspiracy theorist — and yet, as GOP strategist and fellow Trump critic Rick Wilson pointed out on Twitter, she has been right on target with certain key findings in the secretive murk around Trump and investigations into his connections to Russia’s mafia underworld. A Dutch TV documentary shed light this week on some of Trump’s connections to Russia’s lawless elite and explained how the intercepted communications between Trump campaign officials and Russian organized crime figures could have been discovered as part of a money-laundering and organized crime case. Former California Attorney General, now Senator Kamala Harris want Sessions’ head on a pike…Sessions is a criminal, having committed perjury at his Senate confirmation hearings. Having Sessions as the head of the DOJ, is no different than appointing Al Capone as Sheriff. Second, Sessions is actively involved in covering up the Chumph’s criminal activity. And as such is a criminal co-conspirator. Speaking to CNN”s Jake Tapper on Thursday afternoon, Senator Kamala Harris of California renewed Democratic calls for Attorney General Jeff Sessions to resign over the firing of FBI director James Comey. “There is good reason to believe that he was not truthful when he testified before Congress,” Harris said, in reference to Sessions’s confirmation hearing, during which he said under oath that he had no communications with Russian officials during the 2016 presidential campaign. The more James Comey showed up on television discussing the FBI’s investigation into possible ties between the Trump campaign and Russia, the more the White House bristled, according to aides to President Donald Trump. Her calls for Sessions to resign were seconded by her Democratic colleague Ron Wyden of Oregon. This is a common sight in the fields around where I currently live. 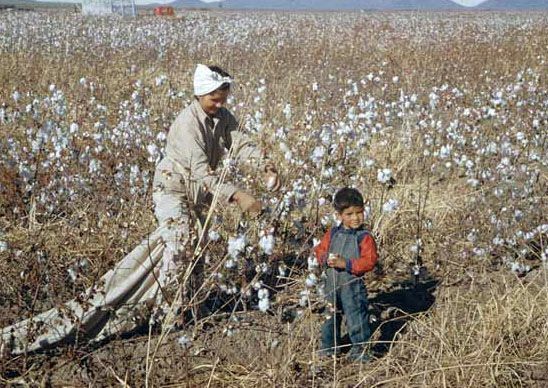 Immigrants, mostly undocumented, picking the crops. These guys disappear…Say goodbye to your spaghetti sauce and pizzas. The pick tomatoes green, and then turn the red by gassing them with nitrogen. Otherwise the tomato is so soft it rots before getting to market. Last year, the tomato field was planted with cantaloupes – the same crew (rounded up by an entrepreneurial ex-illegal – now citizen) was out there to pick them. The Chumph’s Immigrant crackdown is getting ready to cost Americans greatly, and where it hurts – at the grocery store. We have become spoiled since the 50’s days to terrible TV Dinners and certain fruits and vegetables only being available during certain parts of the year. You don’t realize that until you go to a country which doesn’t have the agricultural infrastructure the US has. A number of crops cannot be picked by machine. Tomatoes are too delicate. Add spinach, kale, cucumbers, lettuce, grapes, oranges, apples, pears, and a host of other fruit and vegetables which have to be picked by hand. Since the 60’s, and almost elusively now those crops are picked by undocumented immigrants. 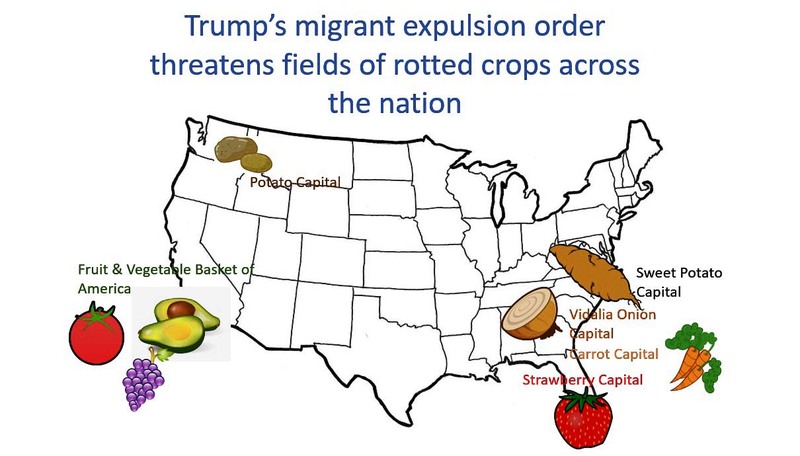 If the undocumented disappear, so do the strawberries, blueberries, and and damn near anything except bananas (they are gown in Latin America) to go with your cereal. What happens to the independent farmer who provides those crops? The line currently at the bookmakers on the Chumph being impeached before the end of his first term is 7/4. Pretty heavy odds with only 24 hours in office. 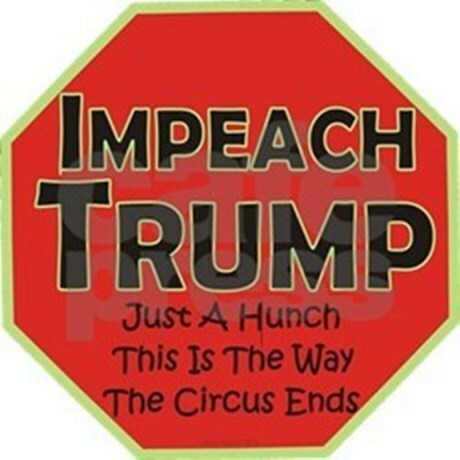 I am not sure that Impeachment is a legal necessity. I believe (but may be wrong), that the Election can be effectively annuled on a Court finding that he indeed accepted illegal monies and assistance from the Russians. This is all new territory here. But such an apprach would effectively make everything since the “election” null and void. As Donald Trump prepares to be sworn in as the next president of the United States today, bookmakers are currently offering odds on whether Trump—the least popular incoming president in four decades—will get impeached or be forced to resign. Some even predict that he won’t survive the first six months in office. 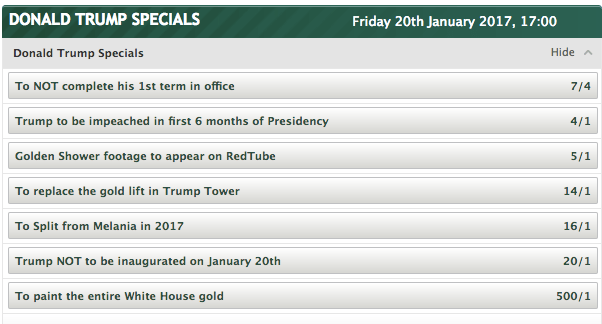 That’s according to the online betting site Paddy Power, which has placed the odds of Trump failing to complete his first term at 7 to 4. The odds of Trump getting impeached in the first six months stand at 4 to 1. Other offerings include bets on the inauguration itself and the future of his marriage to Melania Trump. To be sure, political pundits are still reeling from one of the worst-predicted election results in recent memory, and the mechanisms to impeach a president are far more difficult than one might hope. Yet, Matt Shaddick, who oversees the popular betting site, told the Independent that there has been “completely one-way traffic” in betting trends against Trump’s survival in office. And there is a Paper Trail.